The PriestMartyr Stephen, Pope of Rome, suffered in the year 257 during the reign of the emperor Valerian. Saint Stephen, occupying the throne (253-257) of the Sainted First-Bishop of Rome, zealously contended against the heresy of Novatus, which taught that it is not proper to receive back those returning from heresy. In hiding during a time of persecution against Christians, the saint baptised many pagans, in which number was the military tribune Nemesius – converted to Christ after the saint healed his daughter Lucilla. 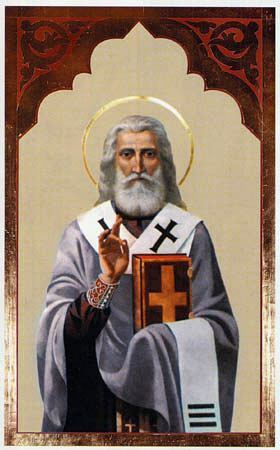 Nemesius, ordained to the dignity of deacon, and also his daughter, were beheaded by the sword. Their steward Symphronius, brought by the tribune Olympius into the temple of Mars for torture, by prayer shattered the golden idol, after which the tribune with his wife Exuperia and his son Theodolus believed and were baptised. They were all burnt. Their remains were buried by holy Pope Stephen. Then were beheaded his 12 clergy: Bonus, Faustus, Maurus, Primitivus, Calumniosus, John, Exuperantus, Cyril, Theodore, Basil, Castelus, Honoratus and Tertullinus, all converted by Saint Stephen. Finally, Saint Stephen himself was led before the emperor Valerian, who condemned him to beheading with a sword in the temple of Mars. But by the prayers of the saint, a large part of the pagan-temple was destroyed, and the soldiers fled. The saint concealed himself in the catacombs (the resting place of Saint Lucina or Lucy), where afterwards he was killed by arriving soldiers while he was teaching Christians.